You know, an amber cube like in Jurassic Park. 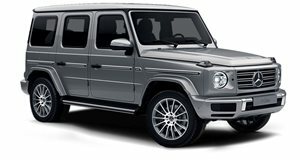 On January 15 at the Detroit Auto Show, Mercedes-Benz will reveal its completely redesigned G-Class. This is the iconic SUV’s first major change ever since it hit the market way back in 1979, so Mercedes is making a pretty big deal here. And rightly so. As that reveal gets closer, the automaker has begun the expected launch campaign and, fortunately, it’s not dogged down by the overused method of relentless teaser images consisting of a headlight. Instead, Mercedes has released this nearly one-minute long video emphasizing the timeless character of the G-Class, despite the redesign. And what better way to boast about its timeless nature than with nature itself in the form of an amber cube. We’re all familiar with amber cubes because, in Jurassic Park lore, it’s how to re-create dinosaurs. Their DNA is captured within the cubes thanks to frozen-in-time mosquitoes containing blood samples. It’s a good metaphor for the G-Class’ timeless nature and the legendary status it’s gained over the decades. Mercedes is even using the #strongerthantime hashtag. Most importantly, at the end of the video the new G-Class is shown in full, though situated in amber. We’ll be on hand in Detroit for the big reveal so expect live photos and plenty of interesting details. Stay tuned.